Motion Math Fractions App Works! | disrupt learning! Motion Math Fractions App Works! Friday a colleague sent me a research study…I was super excited because it’s an effectiveness study for an app that has been getting a lot of attention recently, Motion Math. Before reading the research study, I bought the app myself and reviewed it for instructional design features and functions that I think are important. I was quite pleased with the app. It has feedback for every learner response, levels up when the learner does well, and remediates when the learner makes mistakes (see image at right and caption). The user interface was nice and clean, without distracting elements that are irrelevant to the learning task. It was also easy to use, the required learner response being pretty intuitive and including basic instructions. I really only had two criticisms of the app. First, it is not mastery-based; the learner can choose easy, medium, or difficult options. I would prefer that the learner automatically start on the easy setting and earn the opportunity to use the more difficult settings. My other criticism is that there are no reports of learner performance. If I was a parent or teacher of a student using this app, I would want to know which fractions my child has mastered and which are posing difficulty. So why am I writing this now? When I’ve just told you that I need to do some further reading of the study? Because I want to give HUGE kudos to Motion Math for sponsoring this research. A faculty member at the University of Southern California conducted the research and the research paper has been made public for all of us to read. If you want to check it out, please do, but clicking here. Folks, this is exactly the kind of thing we want not only to be encouraging of app publishers, but demanding of them. There are upwards of 20,000 educational apps in the iTunes app store to date. One of the bigger problems that customers have is figuring out what is “good.” The most common reviews and review sites offer opinions on whether kids like the apps and think they’re fun. Very few of the app publishers offer actual empirical evidence that their app works in teaching kids. We need more evidence that apps work. If you think so too, vote with your dollars by supporting publishers who have empirical data, preferably from studies conducted by independent scientists. I don’t know the Motion Math folks. The closest connection I have to them is that I follow them on twitter and own a few of their apps, so I have no vested interest in you buying the Motion Math app. What I do have a vested interest in, and I know you all do as well, is promoting effective instruction for our kids. By supporting, with our dollars, companies that can prove effectiveness, we can encourage other companies to start doing the same. So think about it. And if you agree, consider spending $2.99 here to tell Motion Math that you like their focus on evidence of effectiveness. And tell them how much we would like them to do the same for the rest of their apps! What other educational apps do you know of that provide empirical evidence of their effectiveness? I would love to know about them! 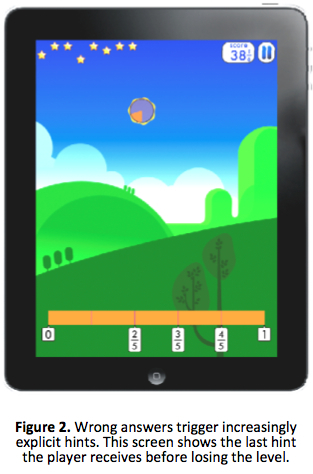 The picture that appears here is a screenshot of Motion Math that appeared originally at http://www.cultofmac.com/133990/study-claims-ipad-app-boosts-student-math-skills/. I reviewed Motion Math HD, v. 1.1.6 on Saturday, August 25, 2012. This entry was posted in App Reviews & Recs, Instructional Design, Technology and tagged App Store, Education, effective apps, fractions, Instructional design, IPad, iTunes, learn, math apps, math education, Motion Math, University of Southern California. Bookmark the permalink. 4 Responses to Motion Math Fractions App Works! It’s great to see the Education app ecosystem moving in this direction. I think this is something of a watershed moment, actually: app developers produce an app, credible independent researchers study its efficacy and publish the results, independent reviewer adds additional insight and helps consumers connect all the dots. I believe those are some of the key components of a healthy, emerging educational app ecosystem that will deliver tremendous value to children and parents alike – and learners of any age, for that matter. Kudos to Motion Math for taking this step and thereby charting a path for others. Thanks, Mike! I think it’s a pretty big deal too. I would really like to see more companies following in Motion Math’s footsteps. But I fear that there are so many review sites out there that emphasize what’s “cute” and what kids “like” that effectiveness may get lost in the shuffle. But as of this writing, I know of at least one person who bought the app based on my review here! So that is one small victory! Now how do we start the stampede?? Thanks for the great post and for linking to the report! I’d be happy to talk over any questions you or your readers have about the methodology and report. Thanks, Michelle! That motivates me to re-read and come up with some questions!